Wow, that was fast! 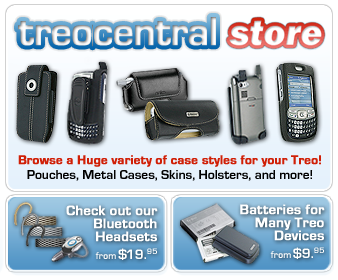 We just reported yesterday that folks had found out that they could order the Treo 800w. A reader who wished to remain anonymous wrote in around 6:43pm and told me that he already had a Treo 800w in hand and that he'd had it for at least an hour already. He got the device early as a favor. Way to go! I just ordered mine (Thursday, July 10th, 7pm). Not only did I get the $249 price, but when I casually mentioned that I was considering getting the iPhone instead, they also threw in a $50 credit to my account to match the price of the iPhone and waived the $18 activation fee. So I just bought the new 800W for $181. Sweet indeed! I don't know if Gary got his 800w yet, but some of our forum members have already received theirs. Now that was fast! Forum member Darth Pooh got his new toy and has started a thread entitled, "What do you want to know about the 800w?". Forum member skfny also got his Treo 800w, and has posted some juicy photos in the forums. Here are a few, plus the one above. Very nice skfny, and thanks so much for sharing! I love the color! A warm slate blue. Mmmmmm. Nice. The 800w sure does look like the Centro, especially the Verizon Cobalt Blue Centro. And skfny has put up some pics today of some programs running. Sweet! Check out these great pics. You can see StyleTap running in the middle pic and that program is said to work great on the 800w. There are plenty more drool inducing pics by skfny in the thread so be sure to go check them out! Let's take a look at some of the questions that were asked of Darth Pooh so we can get a feel of the Sprint Treo 800w. Forum member makrotonik asked how the web browsing experience compared to the 700wx, and Darth Pooh said that it was much quicker with REV A, and WiFi is even quicker. Have you Tried Skype on the 800w yet. This would be a very important thing for me since I would be using skype to supplement getting less minutes by switching to Sprint. Just installed it... sorry, resolution doesn't fit 320 x 320 screens (well not full screen, its offset, but still readable). And then I get a nice old "We're Sorry... cannot start Skype" and promptly crashes on me. Hmmm, hopefully, there will be an update that will fix that problem. Yes I called my girlfriend while she asked me to look up cookies... so that is a check. But back to another sour note, forum member FuManChuu asked about Opera on the 800w. Opera is a bust... it stops responding to hard keyboard input in fields. BUT, it loads and looks good... so it might be the fact that it is a specific build for a device that isn't even released here yet. I am sure the commercial release of 9.5 is going to be just fine! A couple of good things we learn in the thread is that you can talk on a bluetooth headset and browse the web via WiFi simultaneously, and you can receive a phone call while using WiFi. Also, the 800w is said to be lighter than the 700wx and there is NO LAG! That's great news! Head over to the forums and read the entire thread as there is much, much more information and the thread is growing fast.